The parish and village of Stradsett are situated in the west of Norfolk, some 5.5km to the northeast of Downham Market. This small parish has an area of 543 hectares, largely devoted to agricultural activity, and is dominated by Stradsett Park. Stradsett is part of the Clackclose Hundred. The earliest recorded monument is The Mount (NHER 4341), a scheduled Bronze Age bowl barrow that is situated on the Greensand Belt and is visible as a flat-topped earthen mound. Interestingly, this mound may also have been the Moot Hill of Clackclose Hundred, in which Stradsett lies, during the medieval period. The earliest object are a Neolithic flaked axehead and a polished axehead (NHER 14895), although an Early Bronze Age barbed and tanged arrowhead (NHER 14894) has also been recovered, as well as a Late Bronze Age pin (NHER 39566), and an Iron Age coin (NHER 39567). The Fen Causeway Roman Road (NHER 2796) is also known to run through this parish, and it is likely that it is from this that the village and parish gain its name. The word ‘Stradsett’ is thought to be a hybrid of the Latin strata for ‘road’, and the Old English saeta of ‘place’, thought to mean place by a Roman road. Although there are no other recorded Roman monuments, a number of Roman objects have been recorded. These include a small number of coins (NHER 29905, NHER 35358, NHER 44734) and brooches (NHER 35389, NHER 39566, NHER 39567). Despite that fact that no Saxon monuments have been discovered here, the Domesday Book does indicate the presence of a thriving community, and it is not surprising that a number of Middle Saxon coins (NHER 39566) have been recovered. It is also recorded that the community had access to two churches, and although one of these is unknown (NHER 31815), it is presumed that the other refers to the church of St Mary (NHER 4368). Unfortunately no Saxon period remains survive in this building, and the earliest feature is the tall west tower in the Early English style. The most stunning part of the church is an exceptional east window glass, which dates to the 15th century and was brought from Ausburg in Germany and donated by Thomas Bagge of Stradsett Hall. The Hall itself does not date from the medieval period, and there are no other surviving medieval period buildings in the parish. What does remain is largely visible as cropmarks, including those of ridge and furrow (NHER 17492, NHER 31902), as well as the site of medieval tofts (NHER 35482) to the northeast of the village. Medieval objects are limited to some reused stone fragments (NHER 16435, NHER 16436) and coins (NHER 39566, NHER 39567, NHER 45425). 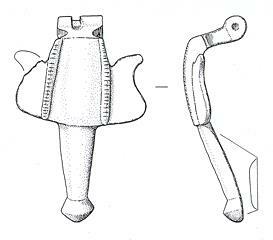 Similar objects have been recovered from the post medieval period, as well as a scabbard chape (NHER 45425) and a 17th century silver head-dress pin (NHER 39566). Stradsett Hall (NHER 4362) is perhaps one of the most interesting post medieval buildings, and was originally a moated property. It was acquired by the Pigot family in 1570, and then by the Bagge family in the mid 18th century. The current building is thought to date to the Elizabethan period and has a Georgian front. Associated with this are Stradsett Park (NHER 18915), laid out between 1810 and 1813, and the South Lodge (NHER 46842). Also of interest is Paradise Manor (NHER 4363), a building that appears to be the only surviving wing of a major Elizabethan house. The wing itself is largely intact and thought to date to around 1600, and it may stand on the site of a medieval manor. World War Two also left its mark on the parish; two pillboxes are known to survive (NHER 21551, NHER 32376), as well as a spigot mortar base (NHER 38095) situated on the edge of Home Farm on the Dereham Road.